Craggy rock pinnacles, forgotten clan ruins, verdant fairy forests, quaint seaside towns all wrapped into one incredible island near the top of the world. Explore Highland culture, clan history, rich traditions, and jaw dropping scenery. There are tales, whispers, and remnants of the ancient Clan MacDonald & Clan MacLeod feuds around every winding turn in the road. 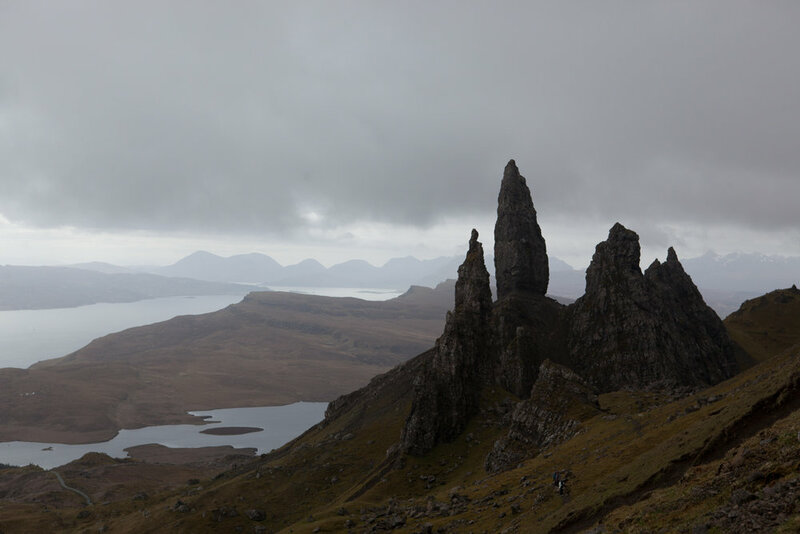 The island is known for it's natural beauty - the first Norse to arrive called it Skye, which means "misty isle" or "isle of cloud" Some lowlanders say that "The Isle of Skye is conclusive proof that God is showing off!" You have to come and see (and photograph) for yourself. Our tours are unique...we are leaving only footprints, but taking home incredible photographs. Bring your "big" camera, or your "wee one" - either way, you will be immersed in breathtaking scenery every day. 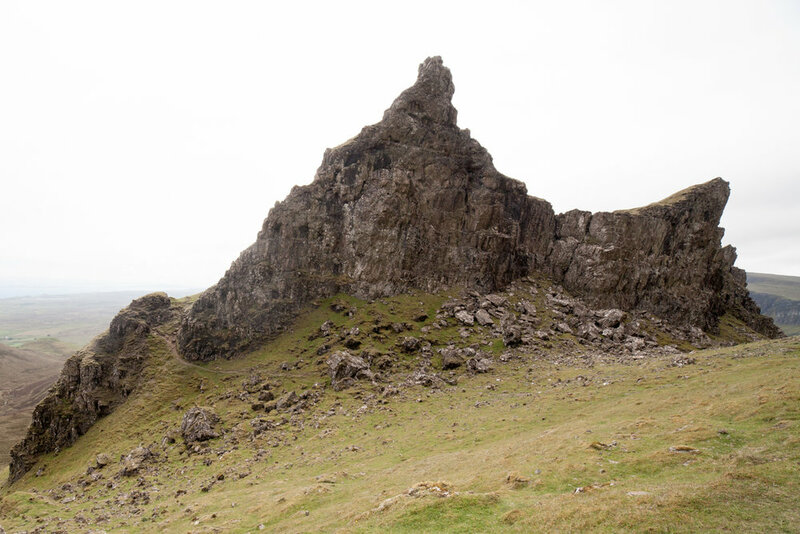 7 days/6 nights on The Isle of Skye. Trip includes all ground transport from Edinburgh to Skye and on the island. guided daily photo excursions, 4 star accommodations & dining, and optional "shoot like a pro" photo & editing tutorials. Click the "Get The Details" button below for the full itinerary and all details. Thanks! We recieved your note and will send the requested info! Scroll down to view a video & more photos. Hit play on photo below to see a 2 minute video of our past trips set to bagpipe music. All photos & video by your tour guide, Geneve Hoffman. Scotland is best experienced up close and personal. Slow down, unwind, and unplug all while experiencing the enchanting Highland culture and life. Will work one on one and in a group with any skill level. Whether you are a novice or a pro, we guarantee you will learn something new to take your photography to the next level. 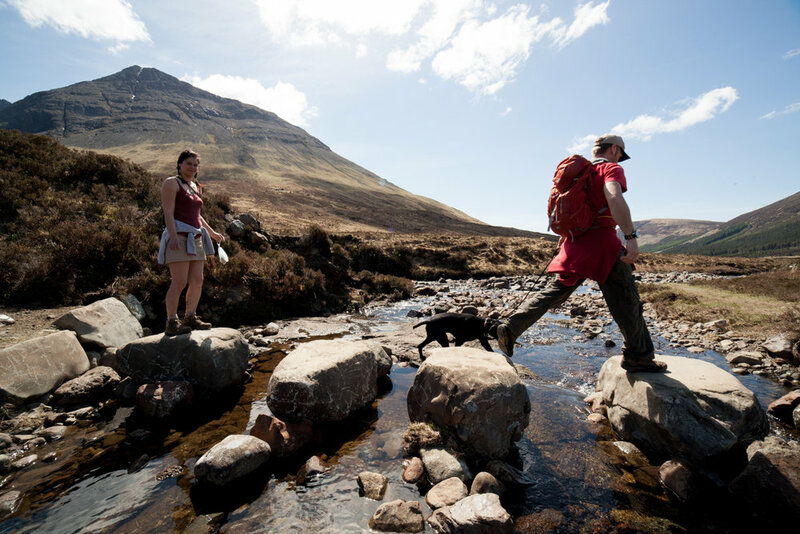 Our "guided philosophy:" Each day you will have time to walk and explore loch views, fragrant moors, and jaw dropping scenery - all at your own pace. "An 18th century country estate, that still feels like a home." We will call our own 4 star inn home for the week. It sits on a quiet peninsula overlooking one of Skye's vast lochs. Explore the extensive cultivated grounds or wander around the seaside farmland surrounding the inn. A hearty Scottish Breakfast and afternoon tea await you daily in the sun drenched dining room. 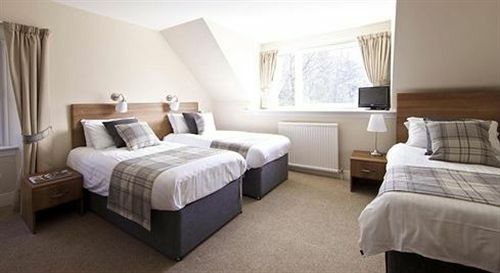 After a fun day of exploring, return home and sit by the fire to unwind, relax, and enjoy warm Scottish hospitality. WHO IS LEADING THIS TOUR? Geneve Hoffman, one assistant guide, and a spirited local guide & driver will be your intrepid hosts and photography instructors. When Geneve is not skipping around the Scottish highlands, she is a professional photographer and Managing Director & Founder of 16 Hoops - A Strategic Design Firm for Photographers. She also has photographed 6 books. 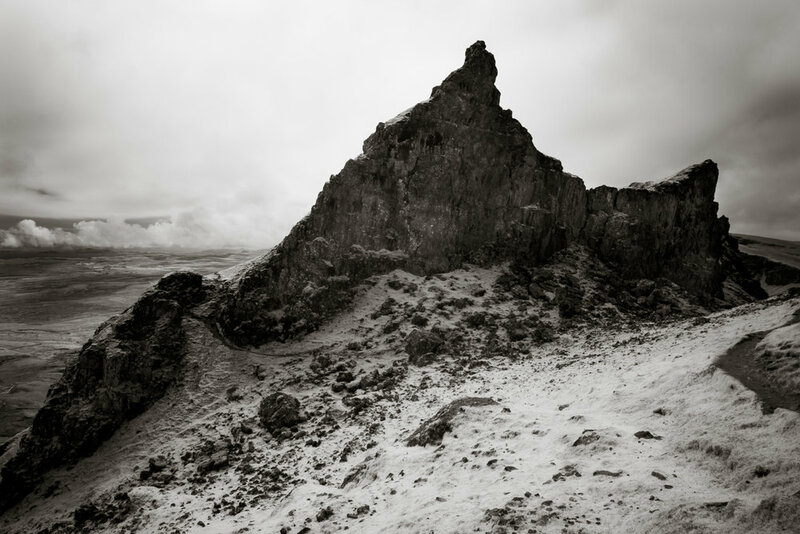 She grew up in New Mexico & Colorado where she fell in love with capturing stunning landscapes. She now lives in Maine with her husband and 10 year old daughter. 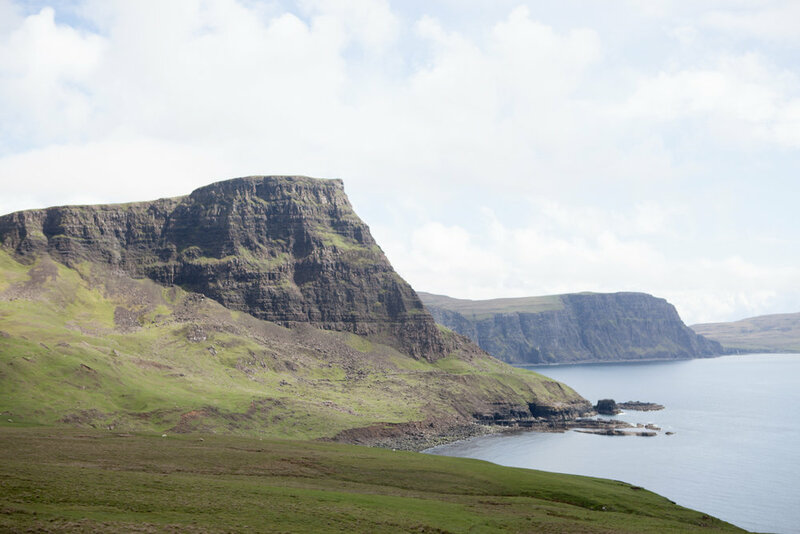 She is looking forward to welcoming each tour member, and searching out your own unique vision of Skye together. Have you ever wondered how professional landscape photos look so different? Learn pro tips in our optional on site photo workshops during the tour. + What is cost and what is Included? The trip is priced $3900 per person and includes daily photo workshops, 5 nights of 4 star lodging in a private lochside country estate, fresh/local gourmet meals, daily photo worthy & cultural excursions...and lots of relaxing! We learned the hard way our first few trips that driving in Scotland on it's very narrow and single track roads is mentally exhausting and takes three times as long as you think it will. So we want you to totally enjoy yourself and we take care of all ground transportation with a friendly and knowledgeable local driver/guide to and from Edinburgh, during the trip, and back. Travel from Edinburgh or Glasgow + Airfare is not included. We highly recommend travel insurance too from Trip Mate. Please inquire below for full Incredible Scotland trip details. + Do I need any photography experience? No - the only experience you need is the experience of enjoying a beautiful photograph. Have you ever come home from a vacation with a thousand so-so images...and are they still sitting on your computer? We will show you how to take the best photos, edit down to the cream of the crop, and have them leap into life in a beautiful book or frame. If you have ever looked at a landscape image and wondered how they did it, you will know how after this trip. Bring your iphone or bring your fancy DSLR - either way we will be sharing pro tips on capturing Scotland in your own way. + Is this tour made for solo travellers or can I bring someone? Because of the photo tour aspect, the cost is the same for each person so there is no "penalty" for solo travellers. We are limiting the tour to 10 ppl max (5 ppl min) in order to ensure hands on photo time together. There will be opportunities each day to have both group time and time alone. We believe that the guided group tour is quite simply the most fun! If you have never been on one before, give it a try and see for yourself how rewarding group travel can be. There is a bond that happens when people travel together in a common cause. 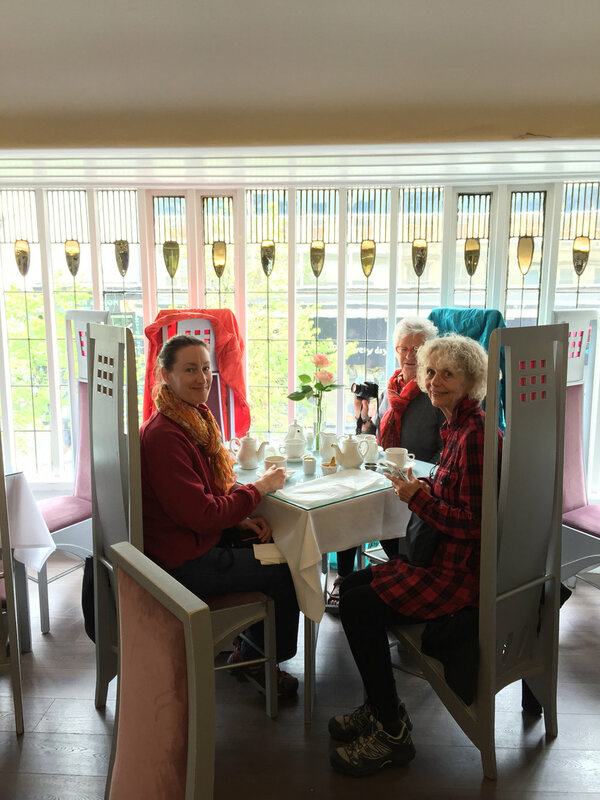 Our joy is to explore the wonder of Scotland together - and you might just find a new lifelong friend in the process. + What will we do each day? We have travelled the world and come to the conclusion that immersion at a relaxing, slower pace works best. This is a less a fast paced “greatest hits,” and more of an authentic experience of highland island culture. Each day the group will venture to one “hands on” photo worthy excursion. We will also have side cultural trips (you can photograph these or not) to learn more about highland traditions like weaving, artisan crafting and art, farming, food and of course optional side trips to a scotch distillery and souvenir shopping. We also leave a little bit of time for the unexpected and serendipitous, which can be the most fun of all. One memorable drive on Dunvegan Head led us right into the heart of a yearly highland cattle drive. It was the most fun unplanned hour we ever spent (and we have the photos to prove it!). + What is the fitness level for this trip? Seeing the Scottish Island and Highlands on foot is the ultimate way to stop and see (or photograph) the real Scotland. But, we also know that one person’s active is another person’s “too much.” So we have designed the trip with multiple guides and options at every excursion so that you can go at your own pace. Each day trip and excursion there are leisure options as well as more strenuous, active ones. Either way, you will get amazing photos of your trip. Part of our philosophy is that you don’t have to look much further than what is right in front of you to capture the unexpected and memorable. You can always take a day off and linger at the inn, enjoy the extensive grounds, and watch the light change on the loch. The main point is to "unplug" completely, and immerse yourself in a relaxing new experience. + What are the lodgings like? We designed this tour for the comfortable and selective traveller. We visited many hotels, inns, and restaurants in person before we hand selected the ones you will be enjoying. We use the inn as a relaxing home base - complete with wifi, afternoon tea, cozy escapes, hearty breakfasts…all with beautiful private grounds and iconic views overlooking one of Scotland’s most famous loch’s. One note - wifi on the islands can be patchy at best and slow at times. So we suggest approaching this trip with a bit of an “off grid” mode while you immerse yourself in all the islands have to offer. + How does the dinner and nightlife work? 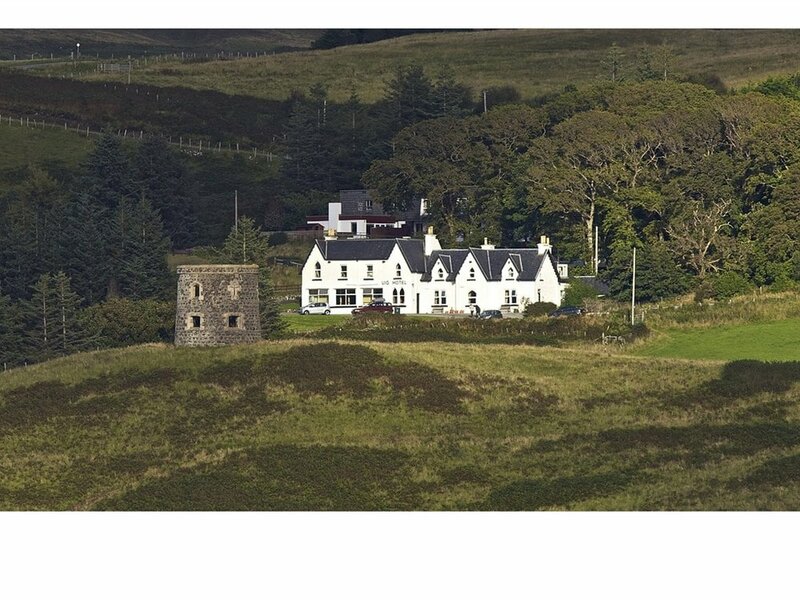 After a day of exploring and leisurely photographing all that the majestic sites the Isle of Skye has to offer, we will retire to a relaxing evening at one of the many enchanting restaurants and pubs in the area. You will get an authentic taste of everything island life in Scotland has to offer. Live local Scottish music at a local inn is a fun way to while away the evening together too. We can accommodate most food allergies as well. + Is this more of a Photo Workshop or a Photo Tour? We think of a photo tour as more of a fun, laid back, "all are welcome" type companionship oriented tour of the landscape, culture, and local traditions. The tour does include guided help & tips for making the most of the amazing photo opps on the island. We only offer tours right now. A workshop, on the other hand (which we do not offer currently, but may in the future) is more of an intensive, hands on daily or weekly tutorial for people interested in learning pro tips to have their work published someday or to possibly go "pro." + Why choose 16 Hoops? We know you have a choice of photo tours. But many of the tours (photo or otherwise) we have seen are either too “crazy” (think too much exhausting driving, not enough enjoying), too “twee” (think endless $$$ rounds of golf) or too rugged (think self guided & tents!). We wanted to create a totally civilized, peaceful, and tasteful photo tour that anyone would love and come away with something special. 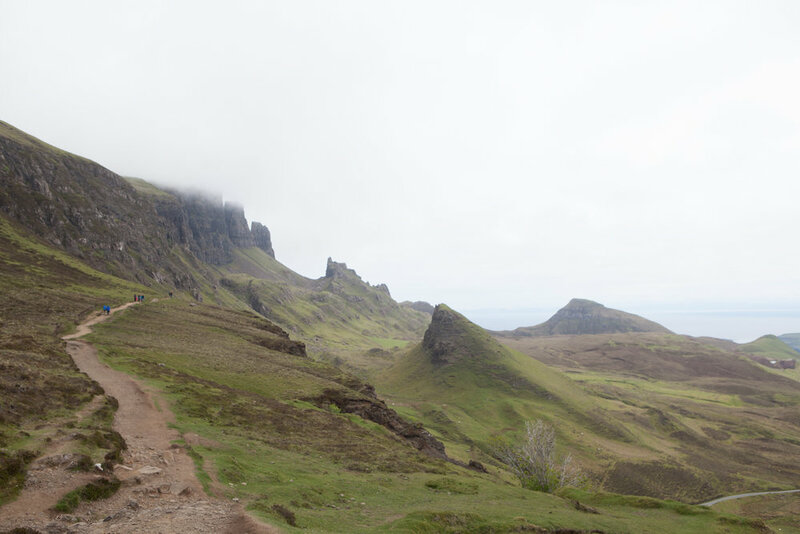 Whether you have travelled the world or this if your first big adventure - we know you will love our take on rugged and enchanting Isle of Skye and Scotland. As foodies & history buffs ourselves, we spent a lot of time curating the best inns, locations, food, local guides and itineraries. We think you will fall in love with unexpected Scotland just like we did - and we can’t wait to share our love of photography and exploring together. Plugs, pounds, passports - oh my. Once your deposit is paid, we will give you a full recommended list of currency conversions, local & international travel tips, suggested Edinburgh itineraries, ATM advice, gear (along with illustrations), and many other important tips of note. We will also send a full list of optional software and video tutorials we recommend if you are wanting to get more involved with the photo optional photo editing workshops. As a member of the tour, you will also be able to access and take full advantage of our exclusive set of video tutorials once you are back home. There will be hands on Lightroom & basic photoshop tutorials each evening for those interested. For those not - grab a favorite corner of the inn and enjoy your free time! We know, life happens. That is why we strongly recommend travel insurance. Trip Mate is a great service. But we have a detailed refund & cancellation policy - just ask for details below. Also, we will take every precaution in our power to keep each traveller safe and secure, but we do require every tour participant to sign a waiver as there is always a chance of illness or injury when traveling, and that is a personal risk you must fully take on yourself. We take a $1725 (approx 25%) non-refundable deposit to secure your spot, and the full balance is due on or before 30 days prior to the trip. If you have to cancel within 90 days of the trip, the deposit will not be refunded, but may be put toward a future trip with us. There are no refunds of any kind 0-30 days from trip. 16 Hoops reserves the right to adjust trip dates or cancel the trip at any time for any reason if there are not enough participants, or if the quality of the trip or the safety of the trip is judged to be compromised in any way. In such a case, refund of all payments received at that date by 16 Hoops shall constitute full settlement. 16 Hoops cannot assume responsibility for any further losses incurred on account of nonrefundable air tickets or any other outside travel fees then paid. Stop reading about this on a website, and come see for yourself what photographing in Scotland is all about! Which trips would you be interested in joining? Thank you! We will be in touch shortly with trip details.